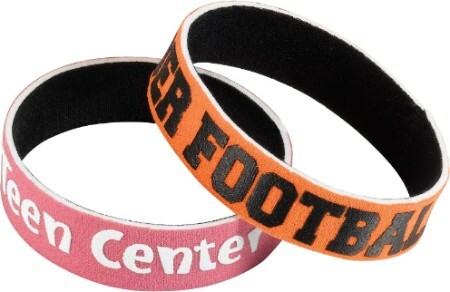 3/4" x 6 inch, 7 inch or 8 inch X 3/4" wide, Neoprene wristbands. These wristbands are an alternative option to the silicone wristbands. They come in several different colors and can be custom printed in one color. The Neoprene wristbands are made from the same polyester material as wetsuits are made from. They are at home in the water. 1 Quantity = 1 wristband. PLEASE NOTE: MINIMUM ORDER IS 100 Wristbands. Discounts are available for larger orders.